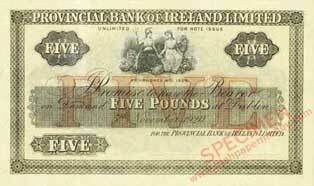 The Old Notes section on Provincial Bank of Ireland notes Series C 1918, Provincial Bank of Ireland notes Series D 1919, and Provincial Bank of Ireland notes Series E 1920-1927 (Irish Free State era) has been revised, with the addition of new introductory pages, and new images covering every known Type (by signature) and denomination (£1, £5, £50). 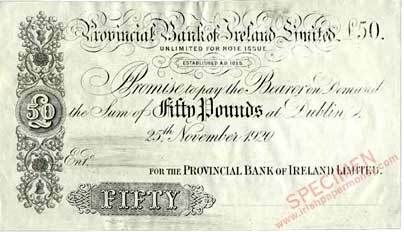 Other denominations as yet unrecorded are likely in Series E.
Also added is a date gallery, Provincial Bank of Ireland date listing 1918-1927 with an image of a banknote of each date of issue for all the issued notes. 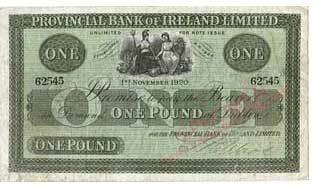 Only £1 notes were issued by the bank in this era. There are proofs and specimens of other denominations pictured also. One known date remains to be pictured: £1, dated 1 July 1919. It is unlikely that there are other issued note dates which have not been recorded. A section on signatures has also been added, which aims to record all signature varieties of the hand signed notes (1918-1921), which cover all three Series. Submissions of notes with unrecorded signatures are welcome. A lot of new discoveries seem to have appeared in the least few years in Provincial notes 1919-1927. 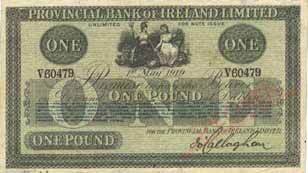 It wasn't so long ago that only the 1919 and 1921-27 £1 notes were the only known denominations. 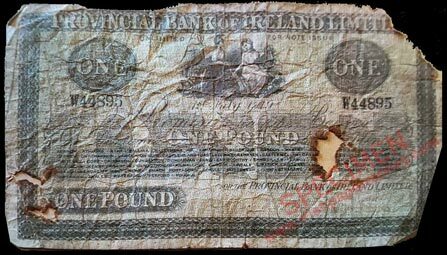 I guess that there was also a £10 and £20 note for the 1920 series which might turn up at some time soon. 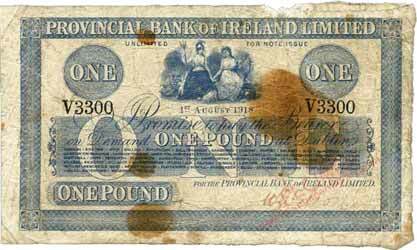 Added a picture of a Provincial Bank One Pound note dated 1st July 1919 to the date gallery. This is the last known date which was missing from this section. It’s not a very good picture, and the signature is not discernible. The note expands the serial number gap for this date nicely, pointing to a printage of around 50,000 notes for the date.